At the request of listeners I’m going to be publishing a big list of links with future Let’s Talk Apple shows. The logical format for me to create those notes in is Markdown – it’s plain text, and quick and easy for me to add new items and re-arrange them into logical groupings. for the most part markdown has little to no overhead, but when it comes to links there is a little work. What I wanted was a way of automatically taking a URL, and turning it into a markdown link where the text for the link is the site the story is from with /… after it. My reason for choosing this format is that I want to give obvious credit to the sources of the stories, but not waste screen real-estate on long URLs. Perl’s URI module can interpret URLs, and easily extract the host part of the URL, OS X Services can take selected text as input and replace it with processed output, Automator can create OS X Services, and Automator can execute Perl code. By putting all these pieces together I was able to solve my problem in just 20 minutes with a few clicks and a few lines of code. You can just download the service with the link below, or you can read on to see how it’s done. 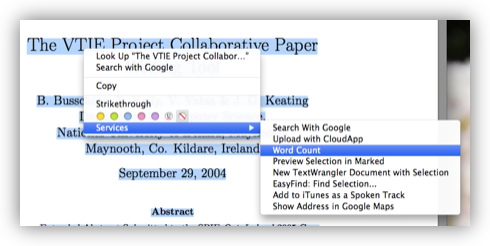 Inspired by a recent episode of The Mac Cast I decided to see if I could come up with a simple way of getting a word count of a PDF on OS X using only tools that come standard with the OS. This is a bit cumbersome though, so I went on to create a simple OS X Service to calculate the word count of any selectable text in any app (the fact that this is even possible, let alone easy, is why I love OS X). To install the service simply extract the automator file from the ZIP archive and copy it into either the Library/Services folder in your home directory, or the system-wide service folder /Library/Services. Those of you who want to see how easy this Service was to write, read on and I’ll walk you through it. Back in 2011 I wrote a blog post explaining how to create an OS X Service for stripping keywords from image files. In this post we’ll use the same technique to create a Service for stripping geotags from JPEG images. As with the keyword stripping service, there are two prerequisites for this action, one is required, one is optional. You absolutely MUST have install EXIFTool installed, and it would be good if you also had Growl installed, but it’s not essential. This is a minor bug-fix update for XKpasswd (my Perl random password generation module). It squashes two minor bugs which came to light while updating www.xkpasswd.net to use version 2 of the module. When the custom_separator option was left blank, no separator was used, rather than the expected random separator. When the custom_separator option was left blank or set to RANDOM, and the pad_char option to SEPARATOR, the results were un-expected, different random character was used for each, rather than the same random character. For documentation and detailed release notes on version 2 of the module, see the release notes for version 2.0. I spent the weekend majorly re-factoring XKpasswd.pm, my Perl random password generation library. V0.1 was the last thing I wrote before reading Perl Best Practices, and looking back on that code really illustrated the value of that book when used in combination with the perlcritic code analyser. The new version of the module provides all the functionality the old one did, and more. The refactoring has made the module simpler to use from within scripts, as well as easier to modify and extend. Some new features have also been added, including the ability to use the www.random.org web service as the source of randomness for the library. A full list of bug fixes and new features is included below. I had hoped to distribute this version as both a ZIP file and a .PKG file, but XCode 4.4 is not being cooperative on the new Mountain Lion, so that will probably have to wait until version 0.3. Update – 6 August 2012: The link below has been updated to point to version 0.2.1 of the code. Details of the bugs fixed in the release notes. Yesterday I posted my thoughts on watermarking images for uploading to the web. This post formed the basis of myself and Allison Sheridan’s discussions in the Chit Chat Across the Pond segment on tonight’s Nosillacast Mac Podcast. During the discussion we talked a little about how I watermark my images, and I realised that I hadn’t released a version of my image processing scripts since 2008! I promised I’d remedy that, so today, after a little tidying up, I’m releasing the current snapshot of my scripts under the FreeBSD license. I’m not releasing these scripts as a polished software package that’s ready to use, but rather, as a starting point for anyone who wants to create their own watermarking scripts. If you’re not prepared to get stuck into the command line and a little Perl (VERY little is needed mind), these scripts are of no use to you! The scripts rely on the free and open source ImageMagick command line image editing tools, so you’ll need to install ImageMagick before you get stuck in. If you’re running OS X, I’d recommend installing ImageMagick via the free and open source MacPorts package manager. Update – 13 April 2012: Apple have released another update to Java (via software update) which automatically disables Java in Safari, and removes Flashback if it has infected your system. Please use Apple’s update rather than relying on this script! Update – 10 April 2012: I have edited the script to run the additional commands recommended by TidBITS. The Download button will now return version 0.2 of the script. It’s finally happened, there has been a serious malware outbreak on the Mac. Over half a million Macs have been infected with the latest variants of the Flashback malware. Earlier versions of this malware relied on tricking users into running an installer, or approving a request for permission to execute, but that has all changed now. The malware moved from being a simple trojan that relied on tricking people into running it, to a fully automated attack requiring no user interaction. The reason for this transformation is that the malware started to use flaws in Java, first, old vulnerabilities that were patched ages ago, so only affecting people who don’t keep their computers up to date, but this week, attacking flaws that Apple had, at the time, not yet patched. This means that for a few days, even the most diligent Mac users could have been hit. Following on from my post yesterday with three examples of using Automator to create Services, and some good suggestions in the comments, I spent some time this afternoon making the script in the third of those examples a little more efficient, and a lot more robust. The Service I optimised was the one to strip keywords from image files. This Service assumes that both Growl and EXIFTool are installed, and that you’re running OS X 10.6 Snow Leopard or later. Update (18 June 2012) – A more up-to-date version of these scripts can now be found here. My Myers Briggs personality profile insists that I “prefer economy of effort”, you can probably translate that to “is a lazy sod”. Because of this I like automating repetitive tasks. It all started when I wanted a quick and easy way to prepare my images for posting to my website. I wanted them resized with my URL and the Creative Commons icon added in, and I wanted to be able to process a whole directory of images in one go. I started by playing around with the GD libs in PHP, but soon realised it would be quicker and easier to use Perl to shell out to the command line tools from Image Magick. At the time I wrote a post on my choice to do this which also contained the initial code. That code has been expanded and evolved since, and now includes functions for rendering nice (in my opinion) borders and titles on my better images. If you want to see examples checkout the Photo of the Week category on this blog..